on the woodside. : *shut up. YOU'RE weird. Tuesday, January 29, 2008 Labels: cookery. I know, I know, I've given you a lot of "glamour." A lot of "epicurean delight." A lot of "room" for "improvement." But there's only so much a single lady (even one with an appetite for life like mine) can accomplish in terms of eating. Over the past week I have accumulated a LOT of leftovers. Some of those dishes will get reinterpreted (please, anyone, give me some ideas for that mushroom pasta dish. But before you comment, you should know J is less than thrilled about fungus). In the meantime, I introduce you to my breakfast. Given my druthers, I really want this for breakfast. But they're not always available in the myriad Woodside grocers' freezer cases, and when they are, they aren't generally on sale. They taste DELICIOUS, though, and I highly recommend. I'll just say on a scale of 1 to IHOP, these are decidedly Waffle House hash browns. And for 1:15 in the microwave, that's not much to sneeze at. In the interest of heart health, though, and acknowledging that I generally rouse myself 17.5 minutes after I need to be out of the shower and drying my hair, I know that my oatmeal will always be there for me. And into the microwave for 1:00. One! On your average Monday, that's enough time to half-heartedly apply your makeup. Or, at the very least, time to spit-clean the mascara from your bottom lids and blink the whites back into your eyes. For four years, I didn't have a microwave. In fact, I didn't think I needed a microwave. JLB bought me this one for my birthday, and I lurv it. 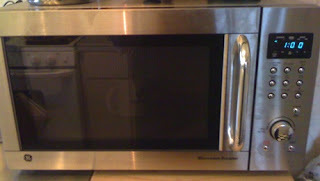 Yes, all microwaves do precisely the same thing. But don't you wish you had one this pretty? Yeah, OK, that looks gross. But it tastes really good. Throw away the raisins and cinnamon and sugar! Plus, half a cup of oats and half a cup of cottage cheese will keep you full until ... February 12. Give or take. There are selfish motives here, I admit. Papa T says commenting isn't necessarily intuitive, so click on "0 comments" or, god willing in the next few minutes, "116 comments", and berate me for my questionable first-thing-in-the-morning taste. I court controversy. Happy Super Duper Tuesday! My breakfast consisted of a Whatchamacallit and five cups of coffee. 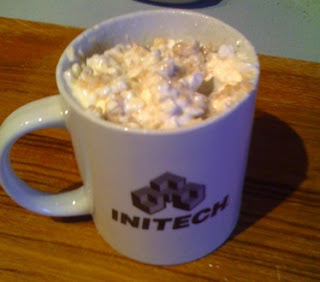 coffee and chocolate is the breakfast of champions! I have the same microwave! 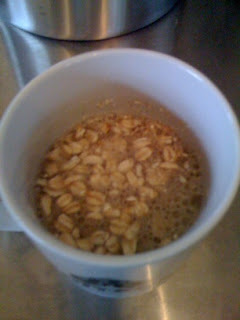 So, on the oats, you have to make sure they're whole oats (just in case someone wants to try your recipe). Quick oats turn into a nasty, gluey paste. I use a little less water so I'll have an excuse to add a little milk at the end. When the oats are hot, right out of the microwave (I do 2 minutes) I toss frozen blueberries on top and use the heat to defrost them. Super little antioxident, bioflavinoids! 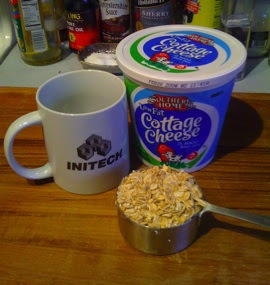 The cottage cheese enhances the flavor by virtue of its saltiness. So you have soluble fiber, protein, calcium, the aforementioned cancer-fighters and a bit of insoluble fiber in one soul-satisfying little bowl. I'm with you Kate! BTW, if you look at the phrase "flak jacket" the absence of the c starts to look more familiar. ok, i totally remember this recipe from those early pre bus stop mornings. - my breakfast routine is coffee (as much as i can gulp down) and either a bagel toasted with cheese or a fried egg and cheese sandwich if i've got the time! m: bioflavinoids or no, i like my oatmeal and cottage cheese unadulterated. also, i'm suspicious of blueberries. is food supposed to be blue? the jury's out. big brother: coffee is too acidic for me. i'll stick to my diet dew! although if we're being honest, it's probably just as well i avoid the inevitable burn hazard. YOUR breakfast sounds delicious. when can i come over? of blue/purple. The deeper the color, the more nutritious. my friend the potato is deeply offended by that. Glad you like the microwave!